Nevada may be most well known for Las Vegas, and its numerous casinos, however there are plenty of other attractions on offer in the state. Whether it’s mountain biking, white water kayaking, or sky diving, extreme sports enthusiasts will find plenty of things to keep them occupied during a trip to the state. And, anyway, those who still want to experience a casino can always do so online with casinos such as Casino Midas and others from their hotel rooms! Keep reading for just a few of the best extreme sports that Nevada has to offer. The Great Basin National Park is home to the quarter mile long Lehman Caves. Discovered in 1885 by Absalom Lehman, the caves are home to some of the most spectacular stalactites and stalagmites that you will ever lay your eyes upon. Due to them being a fragile environment, the caves can only be visited as part of a guided tour. Those wanting a really extreme experience are advised to book onto the longer Grand Palace Tour, which will take you deeper into the cave system. Tickets can be purchased in person, or over the phone. If you’re up for some extreme mountain biking, Lake Tahoe is the place to visit. The lake is home to some killer mountain bike trails along its eastern shore, and with names like ‘Mr Toad’s Wild Ride’ and ‘Flume Trail’ you can expect an intense experience. That said, there are trails available on the south shore that are perfect for beginners to the sport as well, so you won’t have to leave anyone out. The views are fantastic, so bring a mounted camera if you have one! Reno’s Truckee River offers plenty of white rapids for those who like to kayak. Starting in Reno, kayakers can ride the Truckee River all the way to Pyramid Lake in the Great Basin. The breathtaking scenery certainly doesn’t disappoint, and even those who are relatively new to the sport won’t fail to impress on the rapids. Kayaking tours are also available, and these may be more suited to beginners. 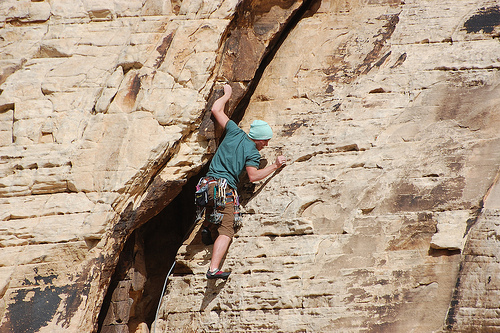 With more than 2,000 rock climbing routes, Red Rock Canyon is said to be one of top 5 rock climbing destinations in the whole of the United States. Routes range from long wall climbs to short boulders, and there are plenty of multi-pitch routes with overhangs and chimneys. Permits do need to be obtained before you start rock climbing, however these can be picked up at the entrance station for $5 a day, or $20 a year. Sky diving has exploded in popularity recently, and there are now dozens of sky diving schools operating in Nevada. Solo and tandem dives can be booked at locations throughout the state, and even first time jumpers are sure to have the time of their lives. With gorgeous views over Red Rock Canyon, the Colorado River, Mt. Charleston, and the Hoover Dam, you’ll forget your fear as you try to take everything in! Nevada may be the home of casinos, but that doesn’t mean there is nothing else to do in the state. Give one of these sports a try the next time you visit! This entry was posted in Air Sports, Caving, Featured, Land Sports, Mountain Biking, Nevada, Rock Climbing, Sky Diving, Travel, United States, Water Sports, White Water and tagged Caving, Extreme Sports, Kayaking, Mountain Biking, Nevada, Rock Climbing, Sky Diving, United States, USA, White Water. Bookmark the permalink.